I remember when I was little, my grandma used to make me those knitted mittens on a string, the string went up one arm, across my back and down my other arm with a mitten on each end, so I would never lose them. They worked! 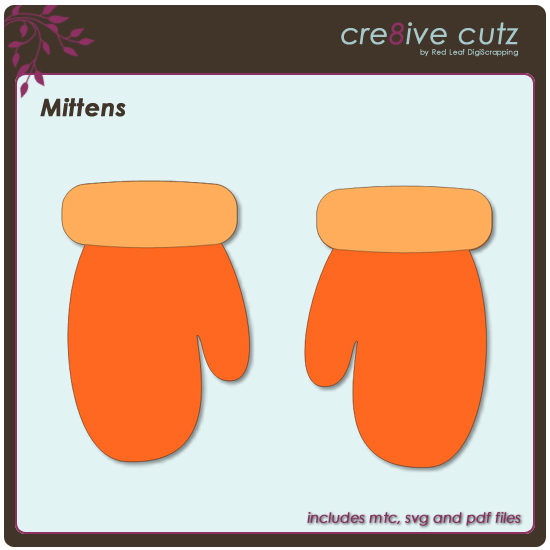 Those mittens were the inspiration for the Mittens cutting file and the little card I made using the file. First the card. I used some bulk white and blue cardstock to make the card. The background is embossed using a ProvoCraft swirly embossing folder (love my Texture Boutique!). The mittens were cut out of white card stock, then stamped and embossed with a snowflake stamp by Inkadinkadoo. Then I used Tim Holtz Broken China distress ink to color the mittens, and the embossed snowflakes resisted the ink. The cuffs were colored the same way, then covered with white flock. A little bit of embroidery floss provided the string, and the warm fuzzies sentiment finished it off. Video Tutorial - Designing Custom Tags in Make the Cut! 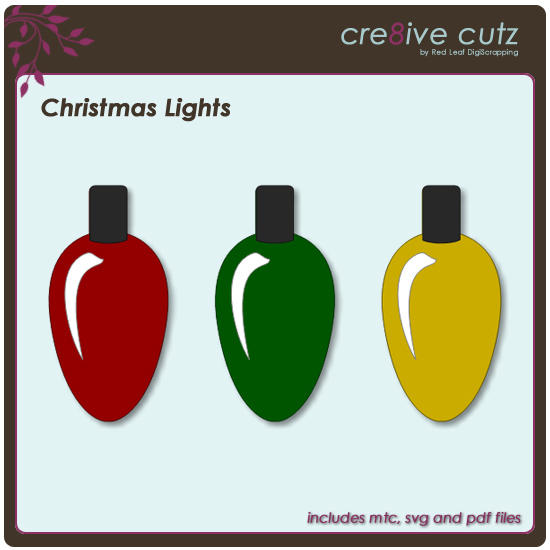 With Christmas fast approaching, many of you might be thinking of gift wrapping ideas, and that includes beautiful tags. Make the Cut! 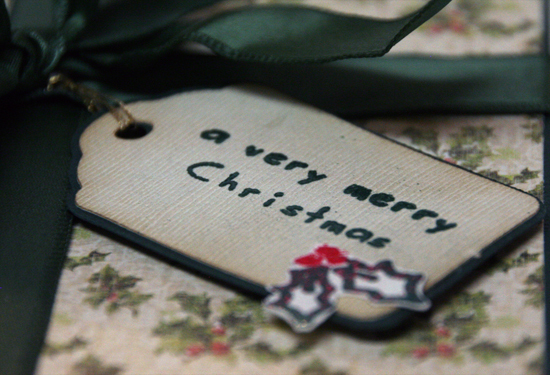 makes it easy to design your own tags to include on gifts. 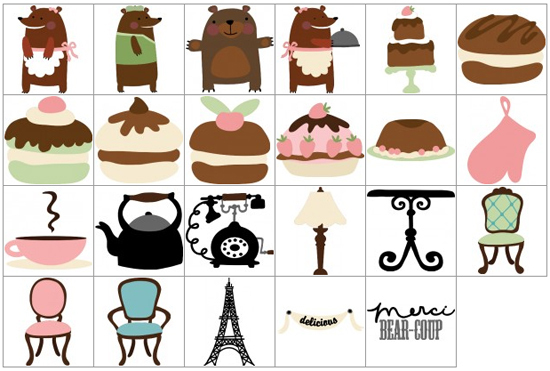 In this tutorial, I walk you through how to use the basic shapes included with Make the Cut! 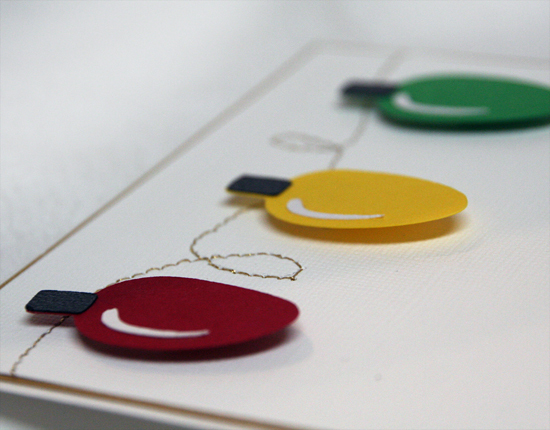 to design your own, one-of-a-kind gift tags. Enjoy! 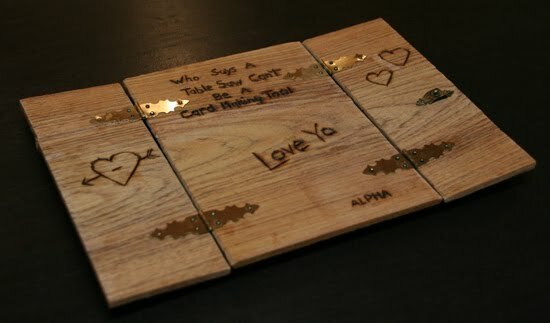 These are a couple more cards I made last weekend. 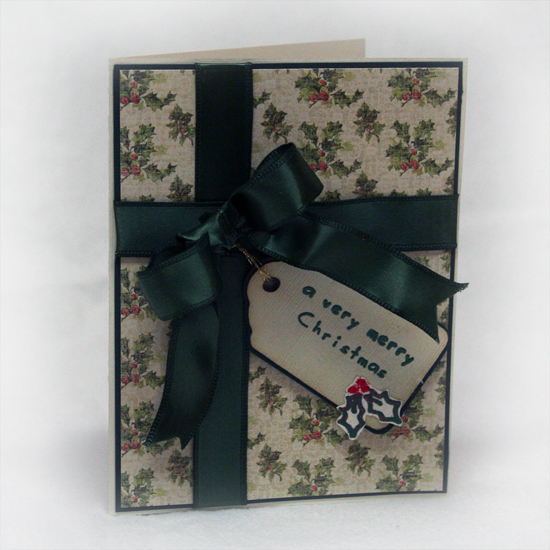 I thought it would be fun to make a Christmas present card, the printed paper is from K & Company. I used Make the Cut! 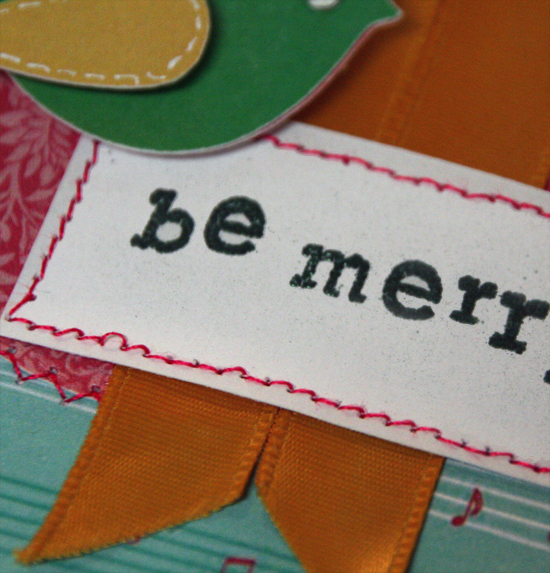 to create the tag, grunged it up a bit with some Tim Holtz distress ink and embossed the sentiment and little holly. The ribbon is wired, which makes it nice and easy to give the bow its shape. 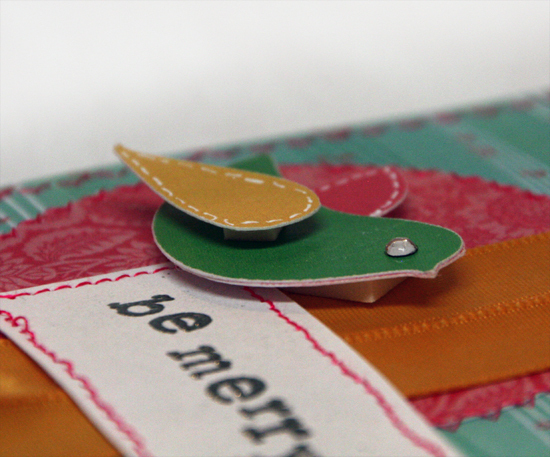 For this card, I used printed paper by K & Company again (they came out with a couple mini paper pads for Christmas that are perfect for cardmaking). I used a large snowflake stamp by Hero Arts and clear embossing powder to add a little shininess to the background (although it is difficult to see in the photos), and stitched around the edge with silver thread. I downloaded a snowflake image from the web, traced it in Make the Cut! and then created a black-out shadow layer. 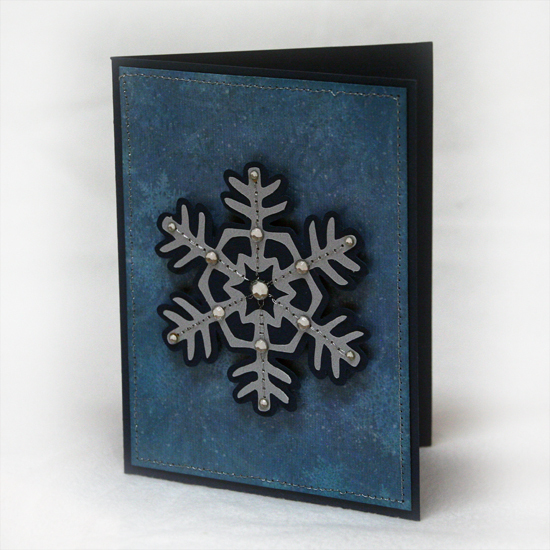 The snowflake is cut from vellum and the shadow layer is cut from dark blue cardstock. Then I stitched the vellum and cardstock layers together using the same silver thread and added some gems to the snowflake to give it a little bling. 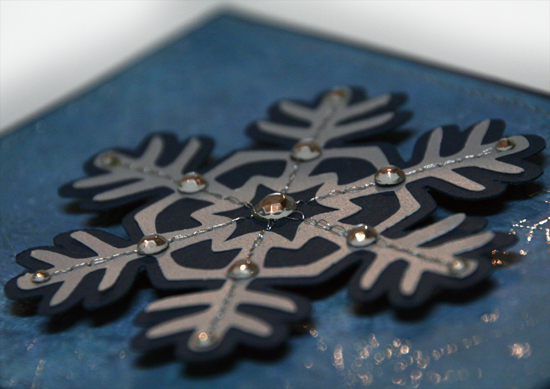 The snowflake is adhered to the card with dimensional foam. 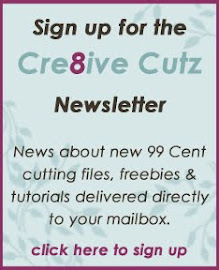 Have you been to the Make the Cut! forum lately? The Nutcrackers in November challenge is going on right now! There's lots of great challenges to participate in, and prizes from great sponsors. (I should know, I'm one of them!! LOL) The challenge runs until the end of November, so there's still lots of time to check it out and create some projects. I don't think I'll be able to get to all the challenges, but I'm definitely going to try a few. For Challenge One, there are a couple of free digital holiday paper packs to download, and the challenge is to create anything you like with them. Here's the card I created. I made a layered MTC cutting file for the bird, you can download it here if you'd like to use it. I also used last week's Mojo Monday sketch for the card design. My sister came over on Sunday and we had a great afternoon crafting together. I got a good start on my Christmas cards, so I'll post pics over the next few days. Here's the first one I'd like to share. I made this using my free Christmas Lights cutting file. To stitch the "cord" for the lights, I penciled the line in, then sewed over it on my sewing machine using gold thread. I used dimensional foam adhesive to pop up the lights. 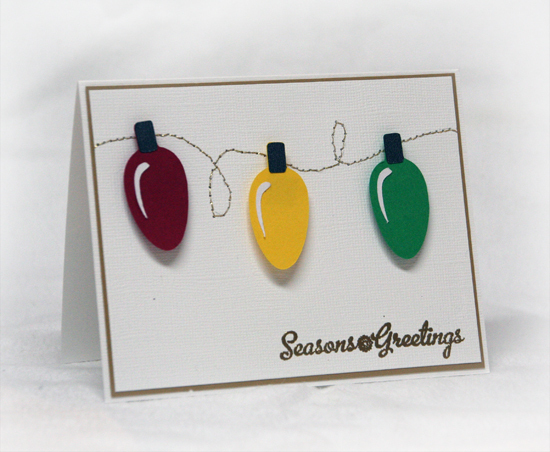 The greeting is a Craft Smart stamp I picked up at Michaels, embossed with gold powder. Hope you like it, I'll be back tomorrow with another! **I apologize, if you downloaded the file previously, the wrong file was linked. It has been fixed. I'm getting a few things ready for a scrapbooking / cardmaking day with my sister today, so thought I'd share this little Christmas light I made to use on a card. Hope you like it, and watch later today for some pics! Also, don't forget about the Lettering Delights sale that's on for two more days, you can read all about it here. Here in Canada, it's Remembrance Day, and for my friends in the States it's Veteran's Day. I'd like to take a moment to thank the men and women who have served and continue to serve so that we can enjoy the freedoms we do. Lettering Delights has a freebie and a special 4 Day sale for you this weekend. The freebie is this cute set of 2011 frames (graphic set), perfect for scrapping a year's worth of photos. And here's a hint; if you download the freebie first, you get a 25% off coupon that you can then use to shop the sale and save even more! And now for the sale! First up is this great bundle of 11 Cut-Its sets for $11. 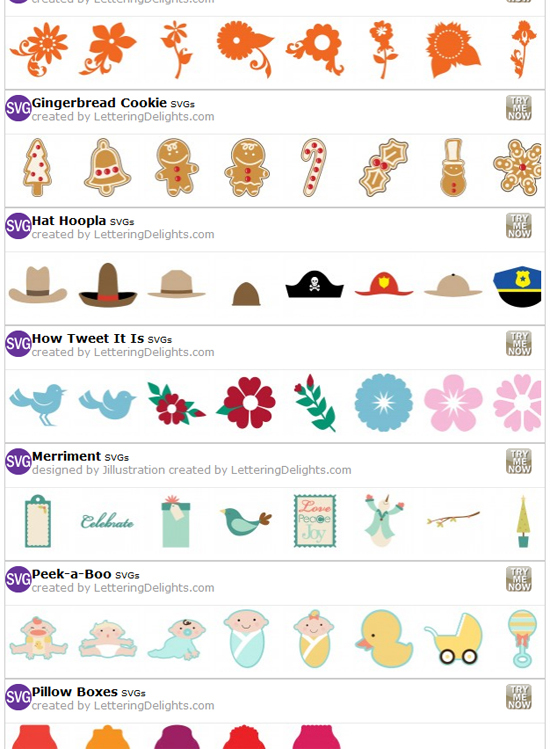 The bundle includes Good Game, Flower Flourish, Gingerbread Cookie, Merriment, Hat Hoopla and How Tweet it Is, just to name a few. And finally, there's a selection of 111 graphic sets, SVGs, alphabets, paper bundles and doodlebats, all for just $1.11 each. 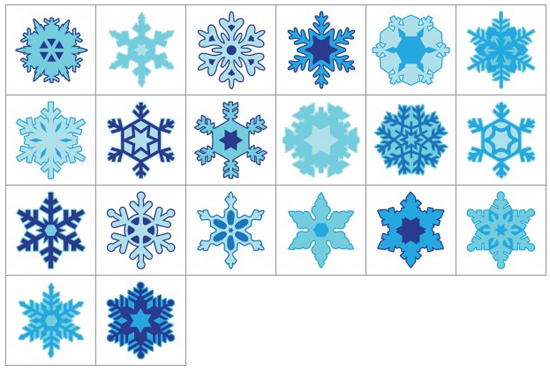 Some of these snowflakes from the Basic Snowflakes SVG set will be perfect for holiday cards and crafts! So hurry over and check out all the great deals, and remember, the sale is only on for 4 days. Have a great weekend! 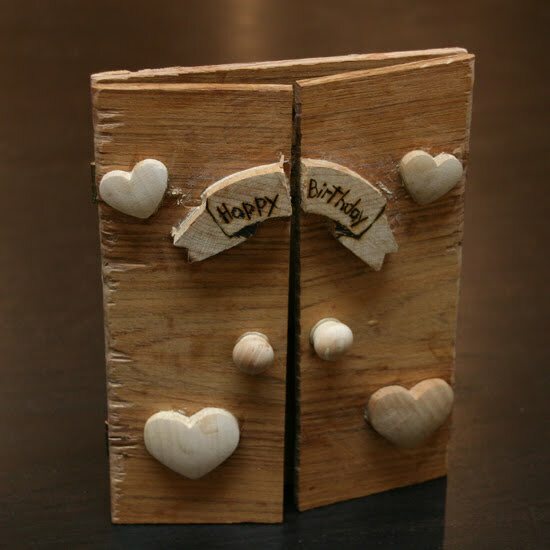 I just had to share this birthday card my husband made for me! It was my birthday a few days ago, so he decided that since I'm always making cards for other people, he should make one for me. But he didn't use my craft supplies to make it, he went into the garage and this was the result. This is how a man makes a card! Here's a close-up of the inscription. 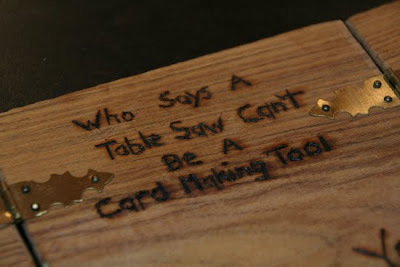 I'm not sure I'll be adding a table saw to my craft room anytime soon, but this is probably the most unique card I'll ever receive! Now that Halloween is behind us, I'm starting to think about Christmas. I'm not one of those people who is ready for Christmas before the kids go back to school (don't know how they do it!) since I prefer to put off thoughts of winter as long as possible! But we just got our first snowfall yesterday that stuck to the ground, so I guess there's no getting around it. 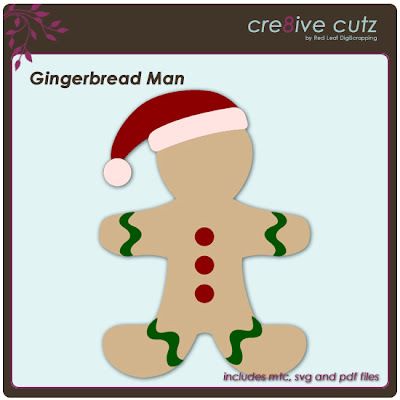 Here's a sweet little gingerbread man I cooked up for you, he'll be perfect on your Christmas cards or scrapbook pages about holiday baking, or even hang him from your tree! His Santa hat is a completely separate piece, so you can make him with or without the hat. Just click on the preview image to download the files. As always, MTC, SVG and now PDF files are included in the free download. Enjoy! 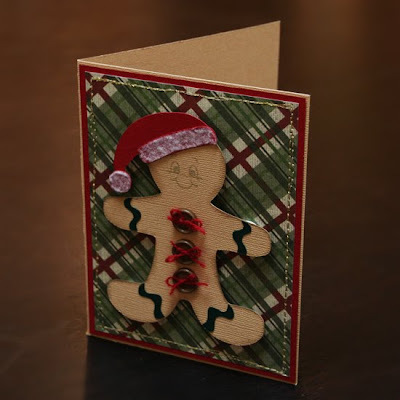 This is a quick little card I whipped up using the Gingerbread Man cutting file, isn't it cute! The face is from the Everyday Character Face Assortment by Peachy Keen Stamps. 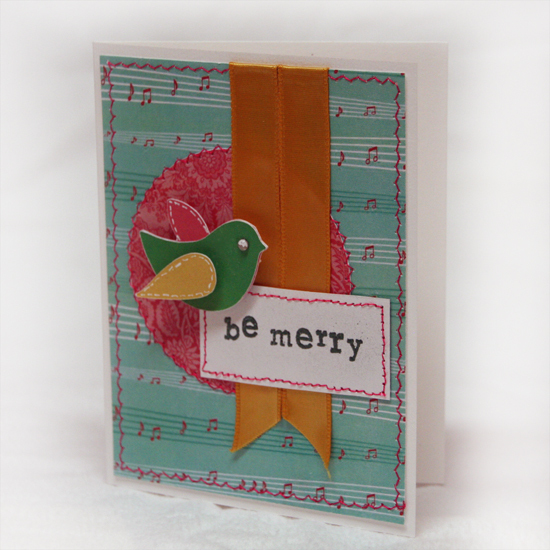 The patterned paper is from a Christmas designer mat pad by K&Company. Other papers are bulk sheets from Michaels, and the flock on the Santa hat is by Martha Stewart.